Until recent times, Koreans used a different calendar to calculate the year and dates for holidays. This was the old Chinese lunar calendar in which months began with each new moon. Because lunar calendars rarely coincide with modern solar calendars Asia festivals such as Lunar New Year hardly ever fall on January 1. Perhaps the greatest Korean holiday is Ch'usok, or Harvest Moon Festival, which is held on the 15th day of the Eighth Moon according to the lunar calendar. That is usually in September or October and is marked by the rising of a full "Harvest Moon." Ch'usok is usually described as a kind of Thanksgiving for a good harvest, but it is really an ancient holiday dedicated to the ancestors. Families gather from all over the country and from overseas for the great holiday. Visitors to Korea are always warned to stay where they are at Ch'usok time because almost everyone is on the road going back their ancestral homes: journeys that by car would normally take two hours might take fifteen! All across Korea, the eldest sons of the family will clean and prepare the burial mounds of their most recently deceased ancestor. 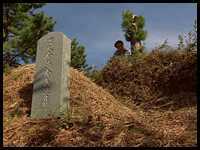 Koreans traditionally buried the dead under mounds standing upright in coffins made from six planks of wood. These represent the four cardinal points on the compass plus a plank for heaven and the other for earth. Corpses either face south or toward some important spiritual part of the landscape such as mountains because these are said to be the homes of the spirits of the land and sky. Even in these modern times ancient symbolism remains important in burial and memorial traditions. In many homes, memorial shrines are set up to honor an ancestor. On the morning of the Ch'usok festival, the family prepares the dishes with which they will honor their ancestors. Special dishes are prepared and set out on tables in front of the shrine. For instance, fresh chestnuts gathered from the forests are cut into jewel-like shapes, for easy stacking. Stacking things, whether stones or food, is a form of prayer. Food is offered to the ancestors and every dish must be passed over burning incense before it is acceptable. The memorial service table has a set order of dishes: five rows of different kinds of foods and sometimes cups of ch'ongju, a famous rice wine. The number five is important in Confucian thought. And fish are placed on the eastside with their heads also facing east. Fish always mean good fortune and the east signifies eternal life. The Kim Family at their ancestors shrine. Everyone bows to the ancestral shrine, including the women of the family. Until fairly recently only men were permitted to carry out this ceremony, but times have changed and women now have equal access to religious rites. The whole ceremony is called Jesa, or "ceremony to the dead." After the ceremony in the home, the family will walk to their ancestors' burial mound. There they bow again 2 1/2 times and offer the spirit food and drink. Some of the food is set out around the tomb facing certain directions in conformity with the Confucian belief that cardinal points on the compass have mystical powers. 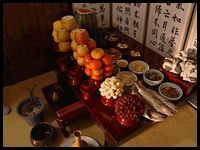 Food and stones are once again piled up as signs of good fortune for the family and for the spirits of the ancestors.